What Egyptians and Mesopotamians were called because they believed in many gods. Egyptian book of spells and prayers was called _____. To protect the pharaoh's body, the Egyptians developed a process called _____. The wrapped body of the dead pharaohs was called a _____. 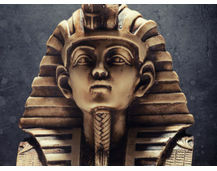 _____ protected bodies of dead pharaohs from floods, wild animals, and grave robbers. During the New Kingdom, pharaohs were buried in tombs cut into cliff called _____. What Ancient Egypt's writing contribution was called _____. Who was at the top of Egyptian social class pyramid? The Nile Valley was ideal for Egyptian civilization to develop because of _____.